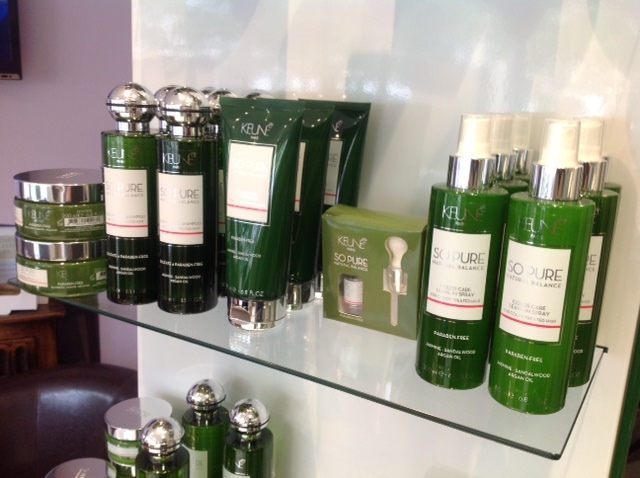 We recently launched as the flagship salon for Keune So Pure in Devon. It is fantastic to have a new range of professional products in salon. Especially as the values of the Keune company and So Pure range resonate so well with our own. Gill Goddard Hair is a family run business. Keune functions as a co-operative rather than as a hierarchical company and are special as they are one of the few independent companies in the giant world of hair styling and the professional hair industry. As a salon we are absolutely passionate about professional and creative hairstyling. So is Keune – take a look at this video to see more. The So Pure Natural Balance range is chemical free; kinder to our stylists and our customers. We have always sourced high quality products, the So Pure Range guarantees an environmentally friendly product without parabens and sulphates, with essential oils at their heart. I can hear you asking what are parabens and sulphates and what do they mean to you and to us? Parabens are chemical preservatives derived from oil and we are, at present, wary of their effect on us. Sulphates are very harsh chemical foaming agents. This can result in stress to our hair and skin. So what makes these natural organic products offered in the Keune So Pure range as effective? The answer lies in a greater understanding of the effective action of mild detergents as cleansers and purifiers. Unlike most hair products that use chemical solutions, So Pure uses the qualities of nature’s gentle cleansing, exfoliating and moisturising ingredients protecting the hair and scalp from the elements of colouring, sun and wind exposure and ultimately drying out. Rather than invent an artificial solution to the problem Keune have developed a concept that is complimentary to nature. This also supports the demands of our environmental footprint and increasing need to address sustainability in our busy lives. The basis of the concept of So Pure products is the use of essential oils derived from herbs, flowers, fruit and roots. Cooling mint, Calming lavender and Energising ginger are part of the range for oily and sensitive scalps and fine hair that needs volume. The emphasis is much more about the products complementing our health and wellbeing. Why should customers buy professional products? Professional products are always designed to enable the expert stylist to prescribe particular treatments for individual customers with specific lifestyles and needs. Generic shampoos and conditioners can be harsh chemical reproductions of professional products. They aren’t able to address the condition of the hair and scalp without further damage and overload. After six years of using luxury products made by a multinational, we are delighted to welcome the So Pure from Keune in salon. We are also, in this way, re-affirming our commitment to sustainable business practices and to using and marketing much more sustainable natural products. Come in and try them. You will love them.